Unusual news today: the sun came out and shined brightly at Two Medicine in Glacier National Park early this morning. How can I know such a thing about a place that’s closed off for the winter and which is nearly a thousand miles away? 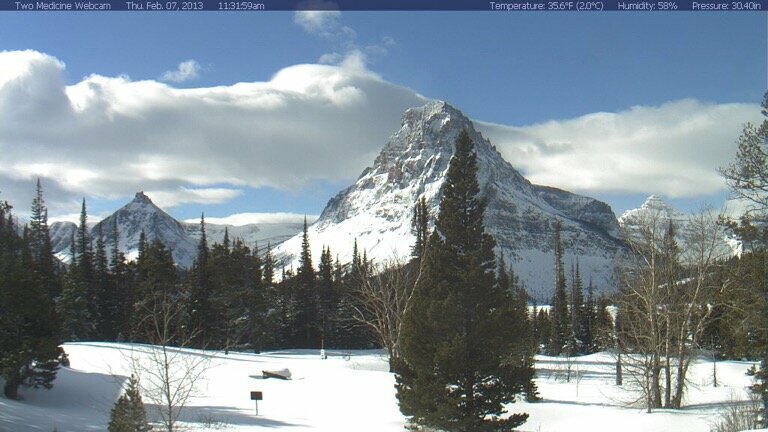 Simple: the Two Medicine Glacier Park web cam (shown above), which showed the sun clearly shining out over a bar of clouds, with Mount Sinopah gratefully soaking up some rare winter rays. This web cam from Two Medicine really is one of the most remarkable webcams in the entire NPS system. First of all, a NPS webcams go, while not perfect, it still gives one a large enough glimpse of scenic stuff to be really satisfying. 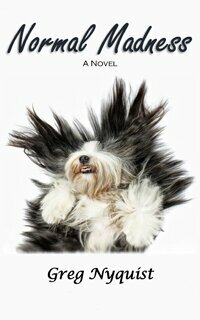 But more critically, what is really amazing is that it should be on at all in the depths of winter. Two Medicine closes as a result of snow in the winter. This year the road closed early in November. It probably will not open again until early in May. The webcam, which is located outside the Ranger Station at Two Medicine Campground, is left on all winter long. While it’s possible to snowshoe or ski to the ranger station in the winter, it’s not likely very many people do so. The winters here are rather harsh. I’ve been keeping track via the webcams the last few years and it’s cloudy nearly everyday, with winds 15mph to 40mph. About a month ago, it was sunny and even windless. It was also 5º. You just don’t get very good weather on the east side of Glacier NP in the winter. In exposed areas, winds can reach 100 mph. Last year, the webcam went out in the last week of December. It was not up in running again until the spring plowing allowed crews to fix the electricity to the Two Medicine Ranger Station. Given the harsh, relentless winter winds, it’s amazing that the webcam sometimes makes it through the winter. As I seem remember, it was up most of the year through the 2010/2011 winter; and thus far it’s been operational all through this winter. On those rare winter mornings when the sun comes out, the scene is truly gorgeous. One almost wishes one was there, until one remembers: it’s a bit on the chilly side in that part of the country. This morning it was 35º, which doesn’t sound bad until one finds out that down in East Glacier (about 13 miles distant) the weather service was recording consistent wind speeds of 20 mph. In my experience, the winds tend to blow even harder up at Two Medicine Lake. While 35º doesn’t sound so bad, mixed with 20+ mph winds, that’s not so pleasant. Incidentally, I’ve been to Two Medicine on five different occasions, twice in late spring, four times in late summer. Twice it was raining. The other three times it was windy and in the 40s. So it doesn’t necessarily get all that much better in the warmer seasons. The one positive is that there are areas in the Two Medicine area that are sheltered from the wind. I once took a boat trip and a hike to No Name Lake. As soon as we were half way across the lake, the winds stopped and remained light until we turned to that halfway point. This was on Labor Day in 2010. There was possibility of snow in the forecast, but it never happened; and out of the wind it was comfortable: in the upper 50s and low 60s.